Today's feature is for the hipster in your life. These cool leather cuffs will look great with jeans and a Tee and isn't it just icing on the cake that proceeds are going to give clean drinking water to those in need. LOVE! Matt Delzell of the M Streets needs to sell 1 billion bracelets. That’s how many Yield Clothing Co. bracelets it will take to reach his goal of drilling 1 million water wells through the nonprofit he founded in 2009, Millions from One. We take it for granted that water is unlimited and cheap. “For a large part of the world, that’s a foreign concept,” Delzell says. Millions from One has drilled 10 wells in developing countries, including India, Peru, Liberia, Uganda and Sierra Leone. 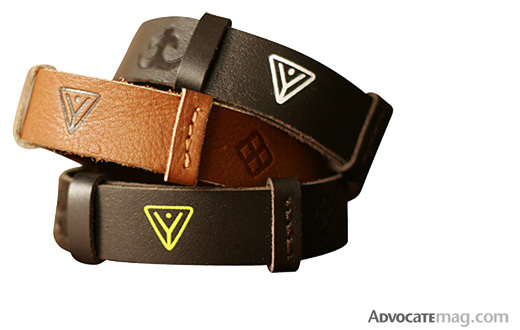 The leather bracelets cost $10, and for every one sold, $5 goes toward drilling a well. It takes about 1,000 bracelets to drill one well. Delzell is a group account coordinator for the Marketing Arm, and he negotiates celebrity endorsement deals for a living. So he has connections. Joel McHale of “The Soup” and “Community,” Olympic gymnast Nastia Liukin and former NBA star Scottie Pippen have worn the bracelets. Buy a Millions from One bracelet at millionsfromone.com.